My day yesterday was bookended by gardens. In the morning, I had a meeting right near one of the entrances to the High Line. I got there with a few minutes to kill, and instead of heading inside to eat soggy pastries with strangers, I climbed the stairs and reveled alone in the curious and beautiful meadow. Gazing downtown, taking in the whole of the vista, the plantings merge into a swath of green cutting through the industrial grit. A closer look, though, reveals a multiplicity of color, texture, leaves, flowers. Blooming now, April, there were grape hyacinths and daffodils and salvia and little red species tulips. A fat bee was working the salvia, and but for him, I was alone in the glorious sunshine in my city of eight million people. In the evening, I played suburban dowager (not really - 95% of the people in the room were older than I am) and went to a talk at my public library - a talk with slide show by Margaret Roach, gardener and blogger. It was packed, and she was excellent. Funny and self-deprecating, she tripped over the latin names of some of her plants and claimed to have buried old boyfriends in her compost heap. I'm ready to plant Ralph Shay and Molly The Witch, respectively, a crab apple and a species peony - but lord knows where I'll find either one. Esoteric garden material can be awfully hard to dig up (ha ha, I said dig up). The "title" of her talk was Nonstop Plants: A Garden for 365 Days - and it was really about looking at the little things, and at the big picture. Plant things that look good in the snow, plant things you can see from your bathroom. Plant tulips under the rhubarb so they peep through the big leaves. Somehow, I think I'm going to be getting dirty this weekend. Sounds lovely. All of it. This is the one weekend I won't be in the garden at all but instead in Baltimore in museums. Also, I wish my bathroom had a window. I really miss that. Remind me to ask you about the orchid tree. All the gardening talk makes me happy-even though I haven't gotten my hands dirty once this spring. Maybe next year. We're planning to spend some quality time mucking out the back yard gardens today. But I could seriously use a lecture like that -- I tend to plant on the blind faith approach, which sometimes works out well, sometimes less so. Monday I drive with my Dad up to Portland ME to buy heirloom roses from a crazy cranky old lady who sells us moisturizer made from the royal jelly she gets from her personal bees. 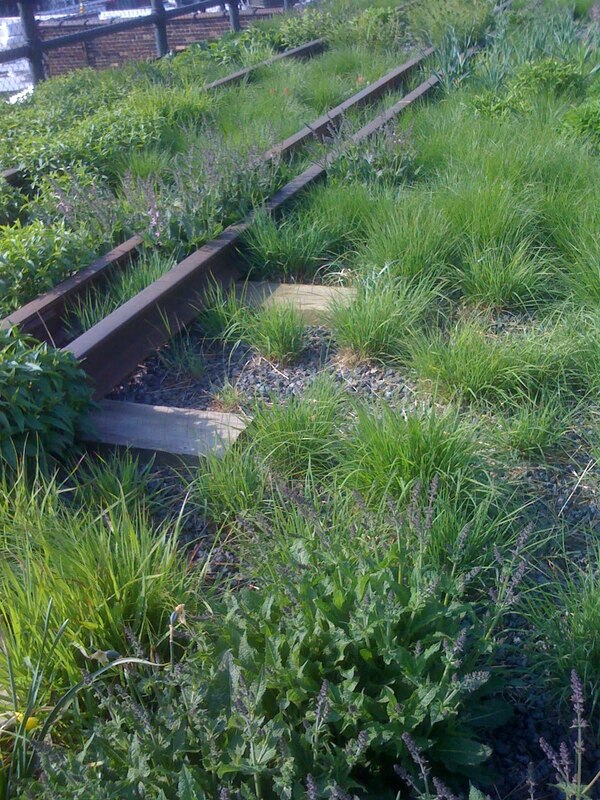 I've yet to see the High Line in person; I'd really love to. And I had no idea about species peonies. Cool. I only have the hussy kind. Look at the little things, indeed. Right now, with the garden a total mess from weather extremes (meaning we gardeners are behind in cleanup tasks but the plants aren't behind in awake-ness), it's good to enjoy the mini-moments....else I might start to freak out.